My problem is that the motor starts up fine but dies as soon as I let go of the key and it turns to the "on" position. I know what you're thinking and I already replaced the ballast resistor. With the key in the on position I have 6.5v at the + side of the coil. I have gone through and made sure everything is tight on the switch and the resistor but still have the problem. I completed all the static timing as per the manual. It seemed to start out of the blue, she had this problem a few days ago then yesterday ran just fine. Now today I can get her to stay running after I let go of the key....arghhhh. Please someone give me idea where to troubleshoot. If my distributor was not grounded properly would that cause it? I suppose I can check that. So I jumpered a constant 12v to the + side of the coil and she started up and ran when I released the key (albeit rough). So that leads me to believe there is too much resistance in the primary circuit. Upon removal of the coil (which I am pretty sure is original) I found the coil itself to be 2.0 ohms, and that is a cold value. Doesn't really sound like a coil failure. A coil usually gets hot and quits running because of an open circuit, and will work again when it cools down, or they won't work at all. So the motor runs, but just runs rough? Do you know if you have the high voltage, surface discharge ignition? I believe Scott changed the 75 HP in 1962. You can usually tell by the plug wires. They have much thicker insulation than a normal plug wire. 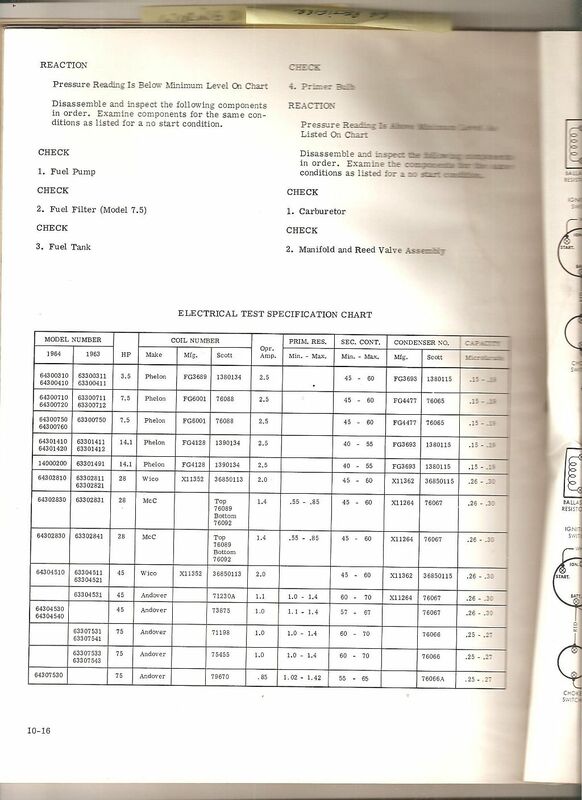 I've attached the ignition coil specs from the 1964 manual. The surface gap coils usually have 1 ohm or less resistance in the primary. Sounds like yours may be high, but most ohmmeters can vary at that low of reading. Where is your ballast resistor located? Very early 75 HP have them on the power head, later motors had them on the back of the control panel, and eventually Scott packed them in the installation kit and had the dealer mount them someplace behind the dash that was away from flammable material and had air circulating around it. Not so easy to do behind the dash in a fiberglass boat. Are you testing the primary circuit with the resistor in the circuit? I'm not sure if it's a surface gap discharge or not. The plug wires were replaced a while ago. The motor only ran when I had 12v going to the coil. When i didnt jumper it the motor would shut off whn i released the key. My ballast resistor is right behind the key panel, the old one gave me 5.2v at the coil and since I replaced it i get about 6.6v. With the resistor and coil in the circuit and the points closed. What type of plug is in engine? I have some NOS Champion UJ17V plugs in there. It's not too important what the voltage to the primary is with the points closed. The coil never sees that voltage because the ignition system is dynamic and with the points opening and closing the voltage is building and decaying constantly. Also the dwell time has a big influence on the peak primary coil voltage and it changes with RPM, but I believe 6.6v is close enough to build an adequate spark least below 3000 RPM. It's what you would expect to see with a 1.0 ohm primary as the coil specs show, and a 1.0 ohm resistor in series in a 12v circuit. Let’s review what has gone on so far. position. This indicates the ballast resistor was OK with a little less than a 1 ohm resistance, and the coil primary is OK with a little more than a 1ohm resistance. The motor should have run. 2. You changed the ballast resistor, and tightened the switch connections. You then had 6.6v at the coil with the switch in the on position. This means the new ballast resistor has a lower resistance than the original that could possibly lead to coil overheating, but not enough to prevent the motor from running. 3. Now you jumpered +12v to the + terminal on the coil and the motor started and ran when you released the key back to on. The motor ran rough. Was it at idle, high idle, or above idle? How long did you run it that way? 4. Now you checked the coil resistance and it’s 2 ohms. It should be close to 1, but it takes an accurate ohmmeter to measure a .5 ohm difference. So now, the motor will crank, but not start on the key switch. It will crank and run roughly with a 12v jumper to the coil, but will not run on 6.3v. It could be an intermittent connection problem or possibly some miswiring, or with the engine running rough, a whole raft of other possibilities including points plug wires or even fuel. If your motor is a 1962 it will have a ballast resistor bypass circuit for starting. 1962 was the only year it was used and it required a special ignition switch with five terminals. I have attached a wiring diagram for it. Two of the five terminals are ignition terminals. One is supposed to be labeled IGN 1 and the other IGN 2, although it does not show the numeral 2 on the wiring diagram, it does on the schematic. IGN 1 is hot with the key on. It has a black wire to the ballast resistor and then another black wire on the other end of the resistor back to IGN 2. A second black wire goes from IGN 2 on to the coil. When the switch is turned to “on” IGN 1 is hot. When the switch is rotated on to “start” IGN 2 is then hot and it bypasses the resistor for an easier start. If you have a 62 motor and switch make sure the wiring is correct and the switch is working correctly. With your original problem being running only on the start position the switch may be involved . To check for an intermittent problem you can make up a new jumper and run it from the IGN 1 terminal on the back of the switch to the old ballast (it appears to be good) and then to the + on the coil. Use eyelet terminals to make sure you have a solid circuit. If it runs OK on that, put the old ballast back in the original circuit and see what happens. If it won't run on the switch try directly off the battery. The motor should run smoothly on a full 12 volts, but you don’t want to let it run too long or you can burn out the coil. Thanks for the tip Don, I ran a wire straight from IGN1 to the coil with my old resistor in the line and I had the same problem, so I took the resistor out and just straight ran a wire from IGN1 to the coil and she started up and ran strong. The only difference being I removed the resistor. 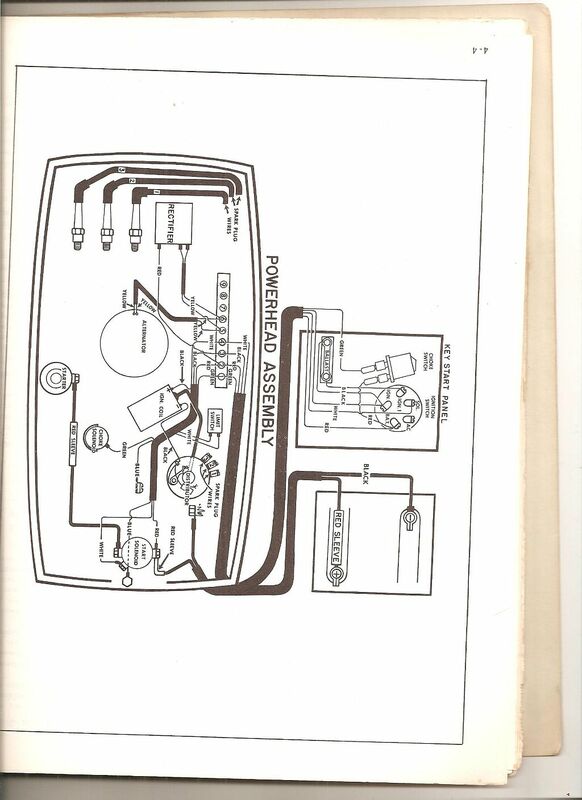 I also checked all the switch wiring and it's exactly like the diagram above. Well i went NAPA and splurged on a $15 12v external resistor coil. Installed it, hooked up the original wiring, and she sprang to life. Here is the video link, please let me know if she looks like she is running okay. It's hard to capture and upload accurate sound but I will do my best. OK, you can run an automotive coil. I've seen it done on 60 hp Scotts, but there are two possible problems. The internal resistance of the primary winding must be about 2 to 3 ohms and I would guess you need to have about .8 to 1 ohm ballast. If the coil and the ballast aren't matched you may either eventually burn out the coil from overheating or you will have a high speed miss and possible rough running. When the motor is running at idle or low RPM the points are staying closed for a long duration and the coil receives a high amount of current. The high current causes the ballast to get hot and it's resistance goes up pulling the current back down and keeping the coil cool. At high RPM the problem is the opposite. The points are opening and closing so fast the current and magnetism can't build up in the coil and the spark becomes weak. The lowered current flow means the ballast stays cooler, it's resistance stays low and it allows more current to the coil hopefully keeping the spark strong enough to prevent misfiring. It's hard to tell how a motor is performing in a barrel because there is little load on it. It sounds good on the video, but you will need to get it in the water to really check it out. If there is a high speed problem you'll know it right away. The heating problem won't be as obvious. It may have to get hot many times before it fails. It just depends on how many time and how long it runs at low speed. You may want to check it now and then at first. How hot is hot? If it starts to turn water to steam you are too hot. Just carry an extra coil and enough tools to change it on the water. The other thing I would suggest it to get the surface plugs out of it if you have any high speed problems because the coil you have may not have enough secondary voltage to reliably fire them. So hopefully your coil/ballast is matched close enough and it works out for you. Thanks for all the help. The primary came out to 2.0 in the new coil and 8.5 in the secondary. I suppose I will just keep a feel for the heat in the ballast and coil and carry spares onboard.